It seems as if Nico Rosberg got a bit grumpy about Hamilton's strategy, as it appeared to Nico at least, of trying to back him into the claws of Vettel's Ferrari. 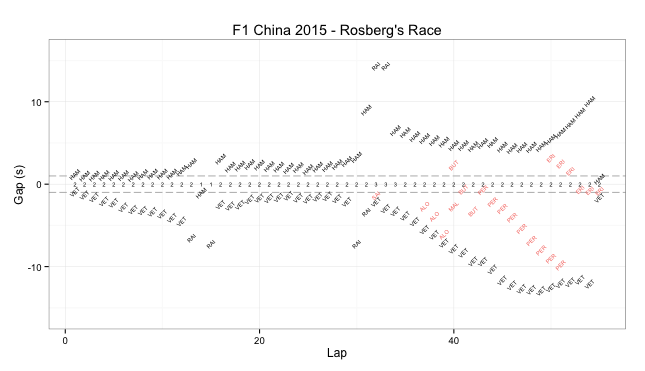 The numbers along the x axis are Rosberg's race position at the end of each lap. The chart shows the time to the car in the race position ahead (Hamilton, black labels, y>0) and the car in the race position behind (y<0, Vettel, black labels) as well as the closest intervening off-lap car in terms of track position ahead and in behind in red. For more information about battlemaps, see Rediscovering Formula One Race Battlemaps.